Discussion in 'Designers and Collections' started by PENG., Feb 26, 2009. That looks great. Best collection of Milan? I love this!!! It's so chic and just beautiful. Am I blind or is this Gisele? i don't think anything from armani had ever looked so benetton? This is terrible, seriously. The styling is particularly awful. It seems like he's trying to design clothes for women younger than his Giorgio Armani clientele, but there's hardly any look in the whole show that doesn't look dated. 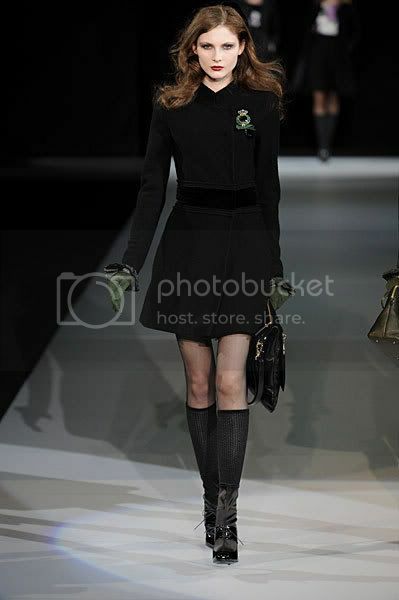 The coats are pretty, but this way too Catholic school girl for me. The shoes are alright I suppose. The socks annoy me to death and the hats are cheap. I dont really like this collection. Armani is usually much more refined and much more chic. Not feeling this, at all. what school these girls will going to? so, knee-high socks will be one of the trend on fall??? i like the styling here though. For me it's a really big disapointment. Seems to be boring and "old", definitely not what I expected.